Lint Lizard is a great invention for removing dryer lint. The link lizard gets down deep into your dryer. If the lint is cleared out this should help your dryer to run more efficiently and cut you're drying time by 15 minutes. The flexible Lint Lizard attaches easily right to any vacuum hose and clears out all the lint that gets past your lint screen. I am sure that you are aware lint that accumilates in your dryer could be a fire hazard. Avoid this risk by cleaning out your lint trap and beyond with this amazing tool. Old fashion lint brushes can just move the lint around, but the lint lizard attached to a vacuum cleaner will pull that lint in. A very easy solution to keeping your lint traps and dryer vents clear. 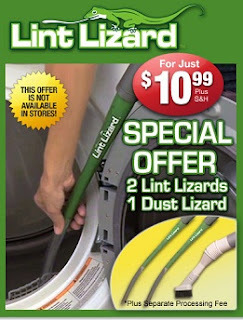 You get 2 lint lizards plus a dust lizard and this offer is not available in stores. The lint lizard is 44 inches long.